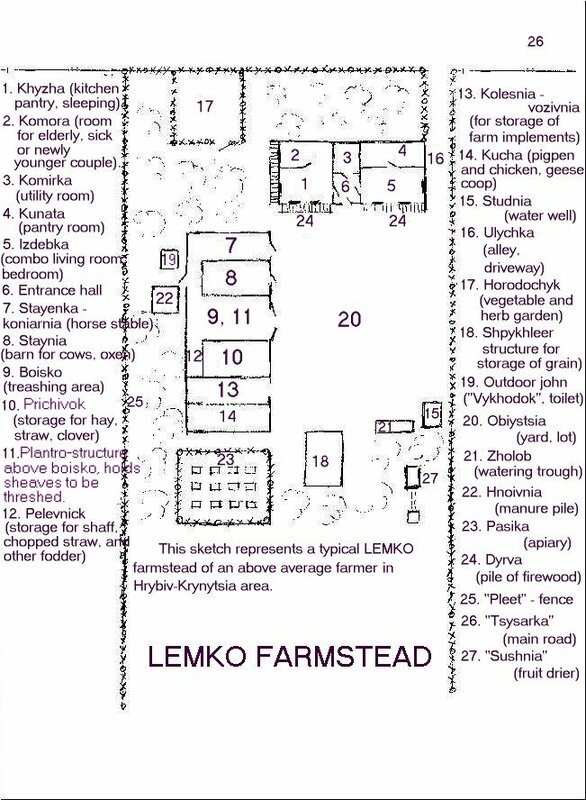 The structures of the farmstead were usually organized into the shapes of the Latin letter "L" or "U" and surrounded the yard "Dvir" or "Obyistsia". "Shpykhleer" sometime also called "Sypanetz" (storage, grainery) was usually built separately over the cellar. Often, however, the cellar was placed under the entrance to the house and izdebka (see 5 & 6) and the grain bins were located in the attic of the house. It all depended upon the ground formation and the house structure. Good Lemko farmers stored three years of grain supply - one for immediate use, one for future planting and one for bad harvest or other emergencies. There also existed an old style of house, so called long house or "dowha khyzha" It was a structure which combined the living quarters and the stables. "Boisko" (thrashing area) served as a divider between them. This house often had no chimney and was called "kurna khyzha" or smoke house. The organization of this type of the house varied from location to location and depended upon the economic status of the owner. The common characteristic of the house was that is was build in line. The owners claimed that such a house was more economical and warmer, both to humans and animals, during the cold winters of Lemkivshchyna. Click the "Back" button on your browser to return to previous page.